Red Seaweed Plant collagen, Hyaluronic Acid and Vitamins C & E, are the foundation ingredients of all the Eyes formulas. They work to moisturize, plump and add nutrients to the delicate under eye are to refresh and rejuvenate. Each eyegel is infused with a combination of natural high-density marine collagen, enzymes, amino acids, natural marine minerals, trace elements, proteins and vitamins. All are paraben free. With just one 20 minute application, you should see an improved appearance of the skin below the eye. Rejuvenating Green Tea Eyes- Super Anti-oxidant Green Tea contains a potent batch of antioxidants (catechins) to combat dark circles and add an extra brightening supercharge! It’s been called a “Tingly Delight” and the scent will calm and soothe the crankiest of moods! Well, I don't know about soothing my cranky moods but this does have aloe vera leaf gel, green tea extract, hyaluronic acid and some taurine in it. So my eyes will be soothed and depuffed happily. I haven't used these ones yet but I think they may become my favorites. Probably because there's no lavender oil in them. 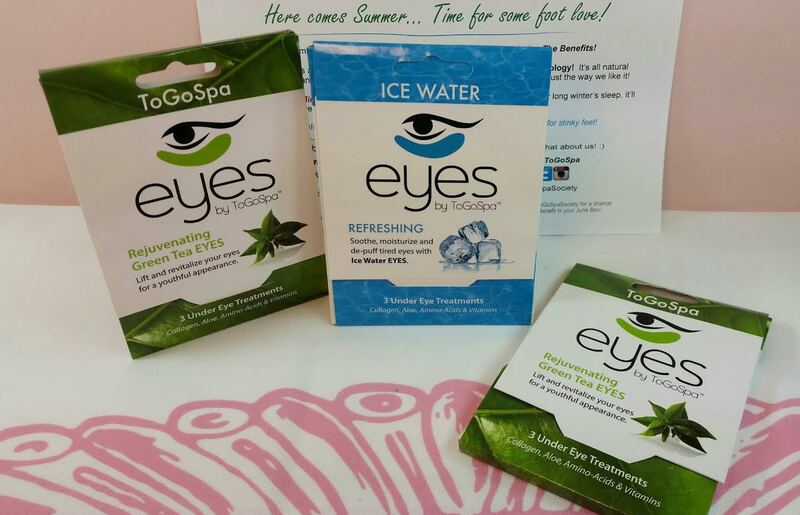 Refreshing Ice Water Eyes-Soothe, moisturize and de-puff with the original Ice Water EYES. Puffy red eyes have met there match and in just one 15-20 minute treatment your eyes will be refreshed and hydrated! These ones also have aloe vera leaf gel and hyaluronic acid but they also have red seaweed plant collagen and L-Ascorbic Acid for brighting. I feel like I should use one of these after the other. And they are definitely soothing. I love them. Plus, hello... My favorite ingredient, hyaluronic acid, is in all three kinds. That should plump out any fine lines. I should take a before and after. 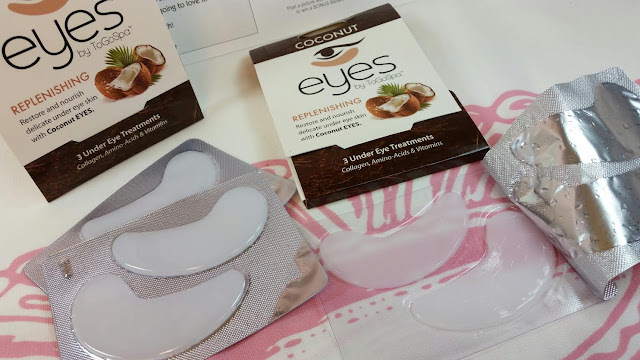 Replenishing Coconut Eyes- We added Coconut Extract and Allantoin for an SUPER DUPER moisturizing experience and with the gentle aroma of Coconut you will be transported on your very own Tropical Staycation! I started with these. How can I argue with a Tropical Staycation? The eye gels are white and made of hydrogel so they're somewhat squishy and wriggly. I slide these under my eyes and was so happy to be wearing them. These are immediately soothing. Just the cool feel of them is probably an effective de-puffer. These have glycerol which is a humectant moisturizer. It draws moisture from the air and absorbs it so it's good for your delicate under eye skin. It will help (along with the hyaluronic acid) plump up the delicate eye skin and eliminate fine lines. Not permanently but for awhile. On to The Benefit! Kosmatology is a wonderful company that specializes in high quality organic and natural products without harmful chemicals or preservatives. Kosmatology "Mint Your Feet" Peppermint-Eucalyptus Soothing Foot Balm- So, I have to confess to a slight obsession with peppermint. I love peppermint and anything that makes my feet happy makes me happy. My feet get super hot at night and I hate it. I keep a moisturizing spray by my bed to spray my feet with when it's unbearable. Is that weird? TMI? Ah, well. Too late now. But I already slathered this on my feet and I'm ridiculously happy about it. They're so soft right now. I think I'll use it on my elbows and knees, too. Mainly because I'm more likely to smell the peppermint if it's closer to my face. Kosmatology "Mint Your Feet Peppermint-Eucalyptus Mineral Salt Foot Scrub-Sea Salt, Organic Carthamus tinctorius (Safflower) oil, Organic Mentha piperita (Peppermint) essential oil, Organic Eucalyptus globulus (Eucalyptus) essential oil. Scrub your tootsies in the bath or shower (watch out for slipperiness) and they'll be refreshed and delightfully peppermint smelling. 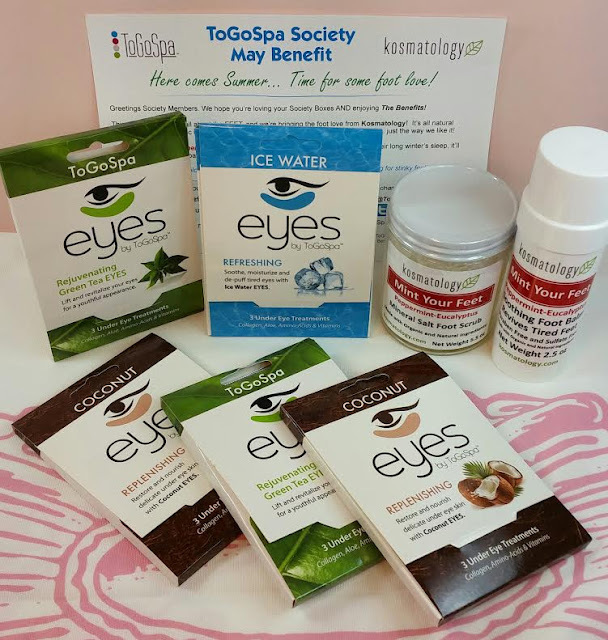 VERDICT: ToGoSpa Society is a great box if you're a fan of eye gels or even face masks (they have boxes with full face masks, too! ), you'll love the benefits of these Eyes by ToGoSpa. Legit ingredients, no strange chemicals, no parabens, preservatives or dyes, you can use these with a clear conscious. They're a little slippery but totes awesome and moisturizing. You'll get five boxes which is fifteen eyegels (that's one every other day of the month!) and then you cannot forget The Benefit! This months box was an outrageously amazing deal. This box has a value of over $80. I don't know what all The Benefits are like but this months was rockin! Sign up here to get a ToGoSpa Society box of your own! Order by the end of day on the 15th to get this box!! Ordering after the 15th means you'll receive next months box. They ship the first week of the month and you should have your box in hand by the 11th. You can cancel anytime. *Affiliate links were used in this post. This box was sent to me for review purposes. All opinions are purely my own. I've been enjoying all the products- there's a lot of products for $40 and therein lies my problem. I subscribe to two other mask subscription boxes and don't think I can use that many eye masks per month in addition to all my others. Huge FOMO but maybe I can buy a box every now and then- they have wicked good products!! Was this your first box? It was mine. And I love peppermint feet products like no other so this box was basically made for me. Yes, this was my premiere box with ToGoSpa. Like you, adore the peppermint foot stick most of all. I had just finished up a foot peel with the K- beauty booties and all. My feet felt so good with the peppermint foot stick. It was amazing. I want another because my feet feel like desert feet despite all my creams, lotions, oils, gels, and other general potions. I really liked the Kosmatology stick better than anything else I've tried and as a fellow Memebox addict, you know I've put a TON of stuff on my feet to make them refreshed and smooth. 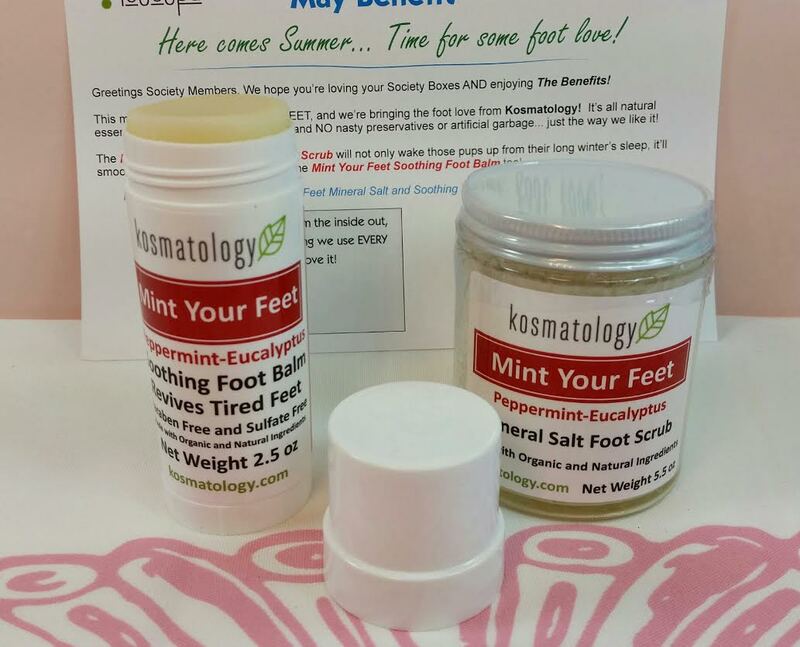 I am glad you got the May box as I know you were envious of those peppermint foot products when I posted them!